There was no time to dwell on the results of Indianapolis with the Paddock heading to Brno for round eleven of the championship – the Czech Grand Prix this weekend. Moto3 saw pole decided at the very last moment with the re-signed Niccolo Antonelli finding a way through the traffic to sneak past the subject of all the press attention for the day down to his link to the Pramac Team, Danny Kent. If Moto3 was all about the last minute, Moto2 was quite the opposite with Johann Zarco taking just five laps to break the lap record before progress halted in the Brno heat. Moto3 Got the qualifying sessions under way with their usual flurry of action, as usual for the class it turned into a very hectic final five minutes with the whole field on track at once. Leopard Racing’s Danny Kent looked to have the session in the bag as the chequered flag waved only for Ongetta-Rivacold’s Niccolo Antonelli to slip and slide throughtraffic to the top spot and claim pole as one of the last riders over the line, the second pole of his career after claiming his first at the end of last season in Valencia. That left British star Kent in second and secure of good pace after being in charge until the frantic end. They are joined on the front row by a third Honda that of Estrella Galicia’s rookie Jorge Navarro, immediately seeming comfortable with the Brno circuit. Just behind him in fourth is his team-mate Fabio Quartararo, with an all Honda top five completed by last year’s race winner Alexis Masbou for SaxoPrint-RTG. Joining them on row two is the best placed KTM qualifier Brad Binder for the Red Bull Ajo team. They went out as a trio and Karel Hanika reaped the benefits, qualifying just behind Binder in seventh, Miguel Oliveira had less luck down in 12th. Efren Vazquez was lacking a little pace which left him in eighth on the second of the Leopard entries with the final spot on row three going to the top Mahindra rider Jorge Martin, taking ninth on the grid for the Mapfre Team. John McPhee had been in a lowly 25thbefore his last lap launched him into the top ten for SaxoPrint-RTG. Championship leader Kent can comfort himself after missing pole with the knowledge that his closest points rival for the title Gresini’s Enea Bastianini struggled in 15th, while Romano Fenati continued to make a meal out of qualifying in 19th. There were crashes for Tonucci, Khairuddin, Ajo and Suzuki. Moto2 set off at a cracking pace with the lap record being lowered several times in succession, but Zarco’s effort on just his fifth lap was to prove to be the best, and kept him in pole position right to the end of the session as the temperature rose and the action fizzled out. 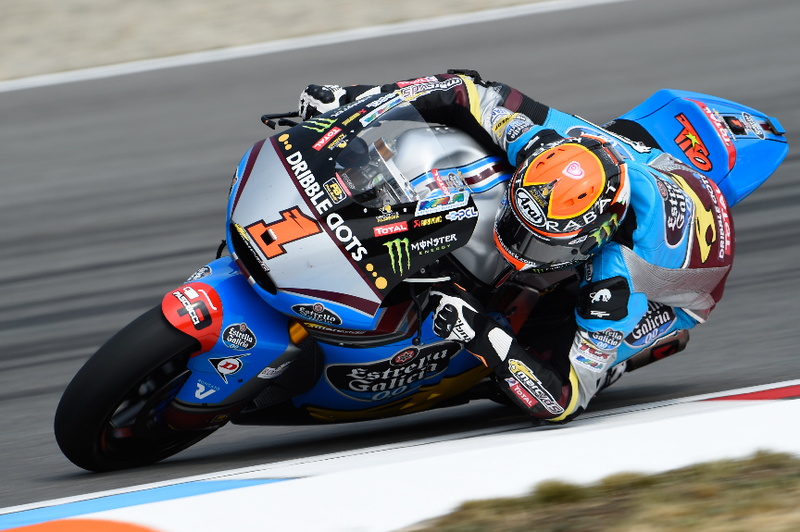 The only other rider going under the old lap record was EG 0,0 Marc VDS’ Tito Rabat who once again showed his strong race pace with long stints on track before ending his session second. He nearly lost his slot late on when rookie Alex Rins, one of only a handful of riders still lowering their time, crept closer and closer picking up a position lap after lap before finishing third at the flag for the Paginas Amarillas HP 40 team. That climb by Rins pushed Sandro Cortese down to fourth for Dynavolt Intact GP, with the Interwetten pair of Tom Luthi and Dominique Aegerter completing row two, in fifth and sixth places. Seventh went the second Marc VDS rider Alex Marquez thanks to a strong early lap by the Spaniard, with a late dash promoting Franco Morbidelli to eighth for Italtrans. The top ten was completed by the AGR Team riders with Axel Pons in ninth just ahead of Jonas Folger on the timesheets taking tenth despite the German having been top in the final practice. Sam Lowes had a nightmare session with him pulling straight in to remove the changes the team had made to his Speed Up after FP3, just when the Brit was into his stride his rear suspension broke, with the bottom of his bike visibly falling down and ruining his session- leaving him 13th. There were near identical crashes for Rossi and Simon at the start of the session and Simone Corsi fell at the end. Previous Previous post: Moto3 and Moto2 Indianapolis – All Change! Loi and Rins first time winners at the Brickyard. Next Next post: Moto3 and Moto2 round-up: Brno – The perfect conversion – pole to win for both Antonelli and Zarco.